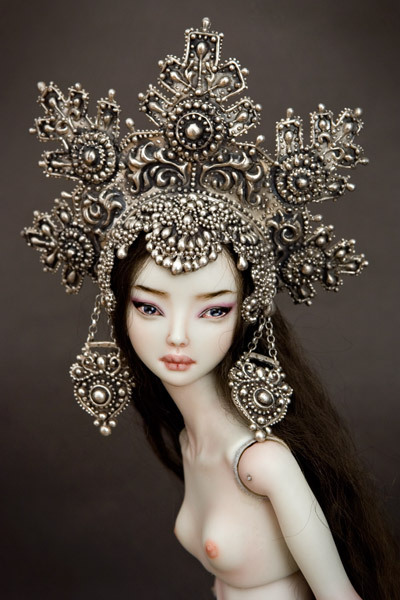 Marina Bychkova creates amazingly life-like porcelain and clay dolls by combining old techniques such as casting with a unique process of stringing the different parts of the doll together so that its limbs move and rotate. She also incorporates intricate details such as fine gold jewelery, tattoos and in some cases even wounds and scars. The results are off-putting but striking and can be explored in the extensive galleries on her website. Each doll is created to order and takes about two weeks to complete and a range of customisation options are available. Elena the Beautiful image from Enchanted Doll. The varied linguistic landscape of the British Isles is well worthy of exploration. One fascinating reminder is the fact that Guernsey has its very own language. 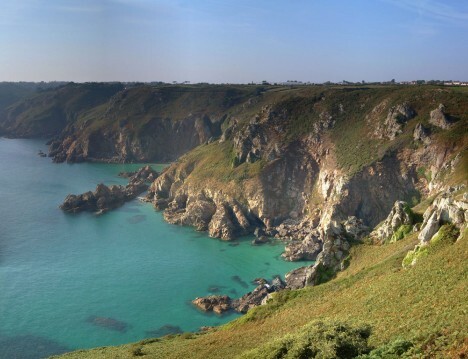 Known as Guernésiais, the language has just over 1300 speakers in total, almost all of whom were born in Guernsey, and hence 2% of its total population. Guernésiais is rooted in the Norman language, itself a regional language of France, ultimately rooted in Latin. Despite some similarities, Guernésiais is very difficult for present day Norman speakers to understand when spoken, although in written form the gist of a text is accessible to Norman readers. Thus Guernésiais occupies the often vague boundary between a dialect – of Norman in this case – and a distinct, separate language. In general, it is often said that a language is just a dialect with its own army and navy. This alludes to the forces which throughout history have asserted one language’s supposed superiority over another’s. If modern day media give rise to forms of cultural dominance, perhaps another formulation of this statement could be attempted – that a language is a dialect with its own TV channels, radio stations and web presence. In addition, its own translation of, say, the Harry Potter books would certainly be a good sign of health, whatever your personal literary taste might be. Guernésiais is painfully lacking all of these things and there can be no doubt that the language is now subject to immense pressure. Indeed, 70% of the remaining fluent speakers of Guernésiais are aged over 64, which is a depressing statistic for certain islanders. Earlier in October 2009, Guernsey’s ministers made a heritage tour of the Isle of Man, paying particular interest to the revival of the Manx language there. Although unlike Guernésiais, which still has surviving native speakers, the language of Manx was totally moribund and widely understood to have lost its last native speaker in the 1970s. Like Manx and also Cornish, there are current efforts in Guernsey to promote its own language and consider it for introduction into the school curriculum. There are few topics likely to provoke more emotion than education and exactly how finite time and money should be allocated to it. Would these resources be better allocated in the teaching of something else, perhaps one of the world’s majority languages? What about practical considerations and job opportunities in the global economy? These questions, while not unreasonable, are predicated on a certain model and philosophy of education. But what is education for? What can education be for? Undeniably, any given language survives because it has the strength and collective will to survive. It is parenting, education, everyday use and institutional will that sustain English, French and Mandarin. If the interest and effort is there, these will be the things that sustain Manx, Cornish and Guernésiais. Indeed, what is language for? A language can be thought of as a technology. It is a useful instrument which serves our diverse needs and interests in communication and human endeavours. One of these many needs might be work, commerce and the generation of wealth. These things adapt a language, as it adapts them. But a language can also be considered in itself to be a form of cultural wealth. Among other things, Guernésiais has a notable resource of poems, some many centuries old. The poems are documents of the place and its history and heritage. But along with poetry, songs, stories and more obvious cultural products, the documentation is embedded and inseparable from its smaller parts – its words, phrases and idioms. In complex ways, a language is also about identity. Guernésiais is a unique feature of Guernsey (even when considering the Jèrriais language, its Norman-derived counterpart on the island of Jersey!). No doubt the Guernsey ministers are seeking to help Guernsey assert this distinctive identity. Arguably, the awareness of a shift towards a powerful Anglo-American homogeniety is a possible factor in their counter-efforts. For a young person of Guernsey, the language presents an opportunity to continue an unbroken link and celebrate what, ironically, all humanity has in common – diversity. Let’s leave the last word to George Métivier (1790-1881), the celebrated Guernésiais poet. Veis-tu l’s écllaers, os-tu l’tounère? Lé vent érage et la née a tché! Ah, s’tu m’ôimes ouvre l’hus – ch’est mé! Do you see the lightning, do you hear the thunder? The wind is raging and the snow has fallen! Ah, if you love me open the door – it’s me! In our seemingly digital driven modern world, it is often said paper is dead. Yet one paper product challenges this thinking: the humble Post It. A simple, yet distinctive design, the Post It is instantly recognisable and remains essential office/home stationery, as well as appearing in the art world amongst art works and installations. In 1968 Spencer Silver, a scientist working at the adhesive 3M company laboratory, stumbled upon a glue that had such an unique pressure sensitive consistency, it was re-useable. It crucially also did not leave a residue. Silver saw the great possibilities in this accidental discovery, yet was unsuccessful in persuading 3M to persue its possible capabilities into an actual product. Six years later, Art Fry, another scientist/product inventor at 3M, was attending church when he became increasingly frustrated at losing his place in his hymn books. His bookmarks were falling out of the pages. Suddenly, he had a divine intervention. What if the bookmarks were stuck to the page, with a light, re-useable adhesive that would not damage the page? He was already aware of Silver’s creation, but had suddenly envisioned the perfect niche to maximise its potential. Together, Spencer Silver and Art Fry returned to 3M and developed the product. 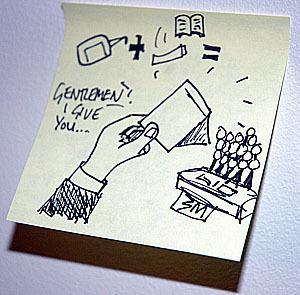 The Post It was finally launched in 1977. 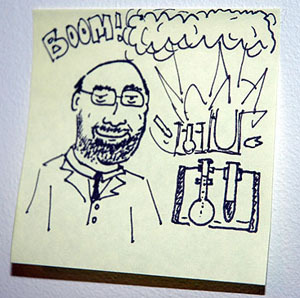 As soon as test samples were sent out, the Post It stuck to people’s consciousness. By 1980, Post Its were being sold across the USA, and by 1981, across the world. There are now over 600 different post it products, illustrating their success and popularity. 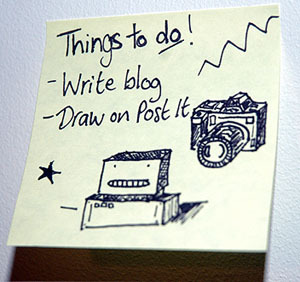 Practically every office or home has a Post It or two lurking on a desk or on a fridge door. They are perfect for jotting down things ‘to do’ or a telephone number, or a shopping list. Yet I find the Post It is perfect for drawing ideas and drawings; quick sketches whilst I am waiting for the computer to load or for the kettle to boil. They are light and small to carry, their design making them perfectly portable, and the adhesive, of course, makes them wonderfully versatile. The Post It is ideal for doodling, a personal canvas that you can hang up on display anywhere, any time. In its short history, the sticky yellow label has gone a long way. A simple design, a huge effect. 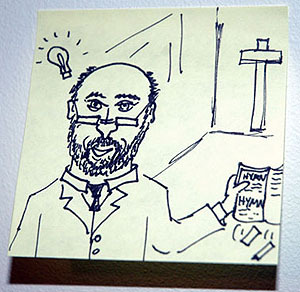 From a laboratory in Minnesota, via a church hymn book, to art galleries/offices/homes/internet videos across the world, the Post It proves paper media still has a special space in our lives. And if it falls off that space, it can quickly be re-attached. Giles Gilbert Scott (1880 – 1960) was a prolific architect, responsible for landmarks that include the Liverpool Cathedral, Battersea Power Station, Waterloo Bridge and Bankside Power Station (now Tate Modern). Ironically, of all these cavernous structures, his most visited design only houses one person at a time: the classic British red telephone box. In 1924, a competition was held to re-design the concrete K1 telephone box, which many London boroughs had refused to install. Scott won the competition (against two other architects), though the Post Office chose the distinctive red colour over his suggestion of silver. Today, most of these ‘K2’ telephone boxes have been designated Grade II listed building status. 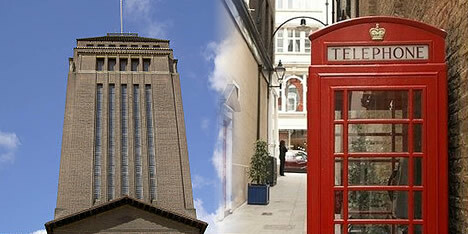 Photograph of Cambridge University Library (left) and Red Telephone Box (right) – both Giles Gilbert Scott designs – courtesy of Wikipedia. OR Books from OR Books on Vimeo. As Rupert Murdoch tries to ban the Internet in a fruitless effort to save traditional printed newspapers, others are looking to the web to offer innovative, new modes of publishing to help keep the industry afloat. Although some people still refer to self-publishing through channels like Lulu as ‘guerrilla’, more and more people from traditional mainstream publishing backgrounds are catching on to the possibilities inherent in exploiting current technologies to invigorate a dying industry. Take John Oakes and Colin Robinson. Between them they have institutional credentials like the Associated Press, New York Times, the Guardian, CNN … and they have jumped ship from the traditional publishing industry to start their own press called OR Books. They are founded on the principal of ‘Platform Agnostic Publishing’, meaning they are willing to use whatever platform and means necessary to sell their books. The term ‘Agnostic’ usually references someone who is skeptical about faith – it’s the “I don’t know” answer to the question “Do you believe in God.” Although the origins of the word as applied to publishing are hard to source, it seems to refer to a skepticism about choosing just one channel (i.e. print) and the willingness to experiment with multiple ‘answers’ to the distribution problem. If a consumer wants a hard copy, OR Books will print it and ship it off (but not until the order has come in – no pre-buy runs, no waste). If you want an e-book at a reduced price, they’ll do that too. The only thing they won’t do is sell to you through an intermediary – they want to interact directly with their clients. Oh, and they also use every tool known to the Internet to market their products, including movie trailers for books. Although they don’t offer the range of innovative options Cory Doctorow does in the distribution of his latest book, they are kicking the crap out of Murdoch who is probably closer to their age demographic and background. One of the best things about OR Books is that because they don’t have a huge bureaucracy, their “system allows a rapid publishing turnaround so relevant books can intervene quickly in issues of the day.” A few weeks ago Sarah Palin released her book Going Rogue and within days, OR Books released their response called Going Rouge, an impressive to-the-moment book about America’s obsession with Palin, written by some leading cultural critics. Yours for $16 in paperback, $10 for the book or $20 for both.